Located where the Rio Grande River makes a U-turn along the Texas-Mexico border, Big Bend National Park inspires repeat visits for travelers who love its serene beauty. Because it is more than 100 miles from the nearest freeway or shopping mall, people tend to stay for several days. It’s one of those places you can go back to again and again, and it’s like you’re seeing it for the first time. Each mode of travel gives visitors incomparable views of this lightly visited national park, and there’s something for everyone. Besides hiking, horseback riding, and jeep touring, here are other ways to appreciate the immensity and remoteness of the land. Rafting. 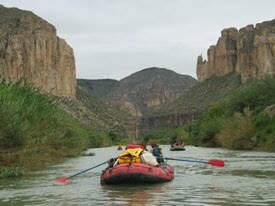 Truly a highlight of any visit to Big Bend, a raft or canoe trip on the Rio Grande can take you through gorgeous canyons where purple mountains and awesome lava formations almost make you forget there’s a desert nearby. 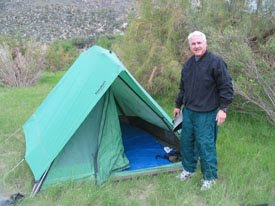 Although you can paddle on your own, a guided overnight camping excursion is really fun. Swapping stories by the campfire is a perfect ending to floating leisurely downstream enjoying the silent scenery of this remote land. Biking. Well-conditioned mountain bikers tackle trails on wheels rather than on foot, but be aware that rocky and often hilly terrain can make covering the trails a good day’s work--whether you use pedal power or rev up a motorcycle. 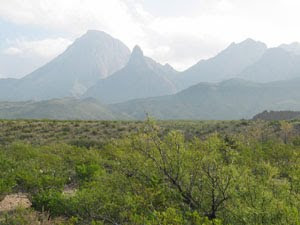 The park publishes two road guides, one to paved and improved dirt roads and one for backcountry dirt roads, challenging paths which lead bikers to views of Big Bend that most visitors never see. No matter how you travel through the park, you’ll enjoy experiencing its unique character, varied topography, and three ecosystems (mountains, river, desert). Evening skies are filled with spectacular shades of purple, blue, and gold--and millions of stars after dark that are clearly visible with no city lights to dim the view. During the summer weather can be hot during the day but quite cool at night; however, fall is an excellent time for outdoor activities in the park, so start planning your excursion now if that season works better for you.